On this day in 1826, the cadets at the United States Military Academy rioted because their holiday eggnog was withheld because it was boozy. This led to the two-day Eggnog Riots. On this day in 1871, Verdi’s opera Aida opened—in Cairo, Egypt. And in 1906, the first real radio broadcast took place: “Reginald Fessenden transmited the first radio broadcast; consisting of a poetry reading, a violin solo, and a speech.” Note that there are doubts about this claim. Finally, on this day in 1968—50 years ago exactly—the crew of Apollo 8 became the first humans to orbit the Moon (they didn’t land; that was the next year). The three crewmen made ten lunar orbits and broadcast live TV pictures, as well as observing an “Earthrise,” which we’ll see later this morning. Notables born on this day include Kit Carson (1809), Matthew Arnold (1822), Emanuel Lasker (1868), Baby Dodds (1898), Howard Hughes (1905), Ava Gardner (1922), Jeff Sessions (1946), Carol Vorderman (1960), Kate Spade (1962; died this year), and Ricky Martin (1971). Those who died on Christmas Eve include Vasco da Gama (1524), Peter Lawford (1984), John Boswell (1994; a well known Yale historian who lived across the hall from me my second year in college), Harold Pinter (2008), and Jack Klugman (2012). 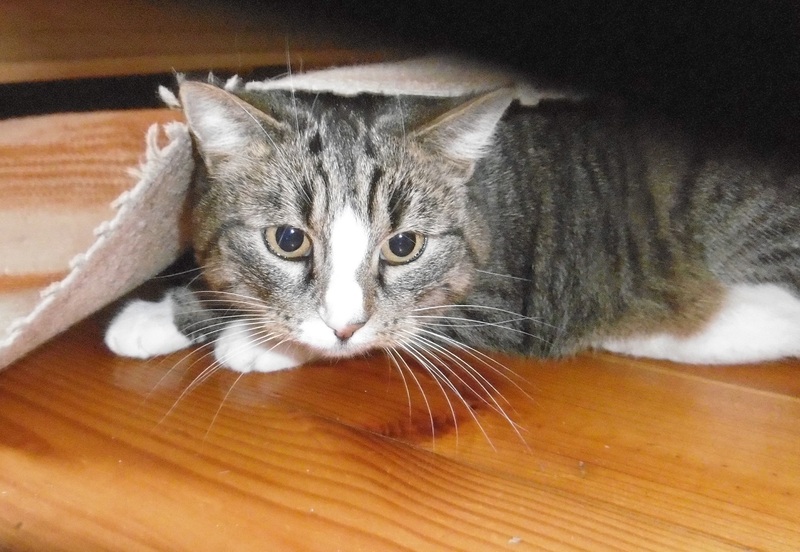 Hili: As you don’t have a Christmas tree I decided to hide something for you under the rug. Hili: Jak nie macie choinki to postanowiłam schować wam coś pod dywan. Some tweets from Matthew. This first one shows an amazing ability that, if I didn’t like to use the word “spiritual”, would describe the effect it has on me. Animals are amazing! Go to the link in Alex Wild’s tweet to see a gallery of ant mimics. But can you guess what this one is? I saw this on the news two nights ago. I am amazed the driver was only banged up a bit, with no serious injuries. Matthew says that this HUGE stuffed rabbit is no longer there. Look at its size! Heath Robinson’s mum knew she was about to give birth to her son when she started having contraptions. He must be drunk. . . This entry was written by whyevolutionistrue and posted on December 24, 2018 at 6:30 am and filed under Hili Dialogue. Bookmark the permalink. Follow any comments here with the RSS feed for this post. Both comments and trackbacks are currently closed. Eleven hours to go here in the UK, and I shall be drinking Bushmills and toasting your health. 19 minutes to go here. I think from the eyes, and legs, and what looks like palps the ant mimic is a spider. It’s missing one leg. I broke in to the heartiest of guffaws ! Perfect ! the stupidest ! Who ‘ld give these as bambino gifts ? ! Mama needs diapers ! For Jebua’ sake. Literally ! 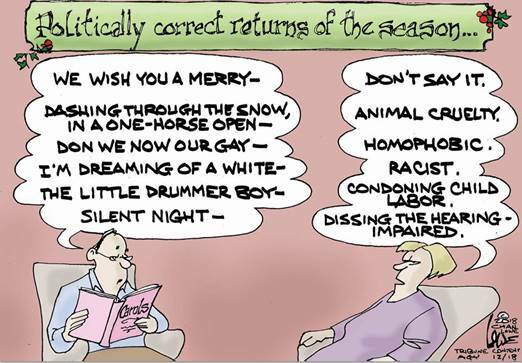 And NO drumming either, Little Drummer Boy ! QUIET ! Men ! Men, and NO woman, ” d e s i g n e d ” the biblette ! This year’s greeting was slightly less festive, and definitely not child friendly, in the form of this link taken from Friday’s Hili. There’s plenty of late-year celebrations and I tend to anchor them with Saturnalia and in particular cold snowy winter weather. But what about people from lands in the Southern Hemisphere? That ruins my neat tidy view of it all. That IS a very good boy. It brings to mind, though, the old Sam Kinison’s bit on the famines in Africa. Refering to the cameraman filming a starving child for an aid plea: “Why don’t you feed him!? You’re standing right there! ?” It’s great that the dog helped the cat, but why didn’t the person filming it? Going through Alex Wild’s gallery of ant mimics is a great way to spend some time. My favorite is the crab spider that uses its rear end to mimic the face of an ant. I think you mean Rube Goldberg was the American equivalent of Heath Robinson. where’s Jimi when you need him. Hendrix if wondering who Jimi is. Happy Coynezaa from Hong Kong!